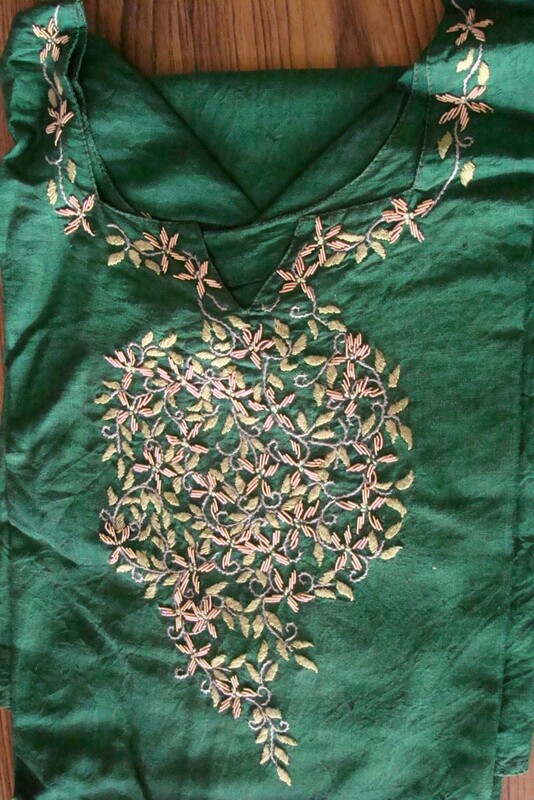 The embroidery was worked on cotton fabric. 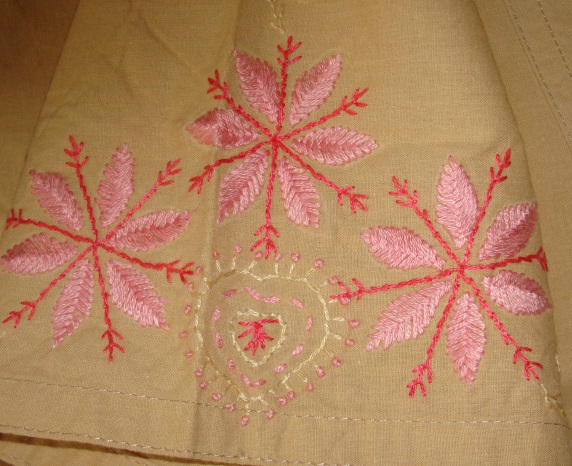 The ideal fabrics for chikan embroidery –transparent cottons, chiffon, crepe. But the fabric I worked was not transparent. 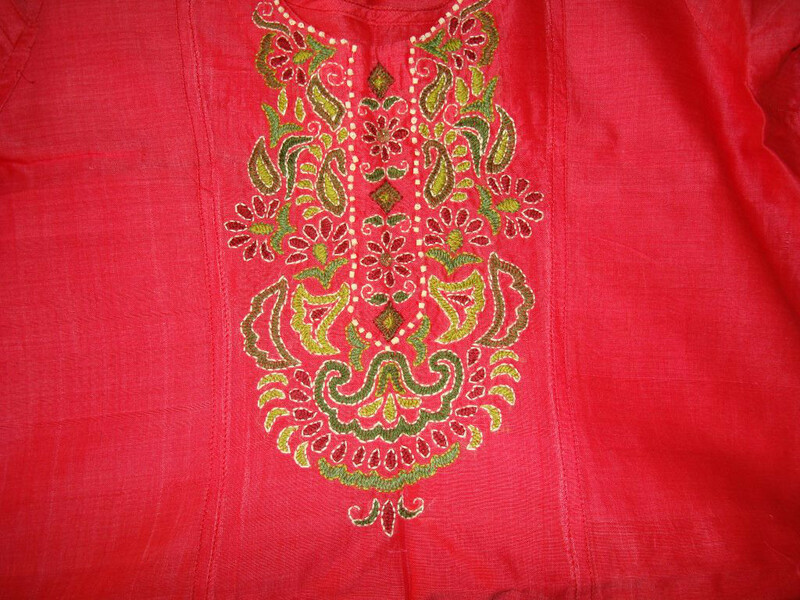 So technically it was just an use of chikan embroidery on the tunic and not the authentic chikan work. 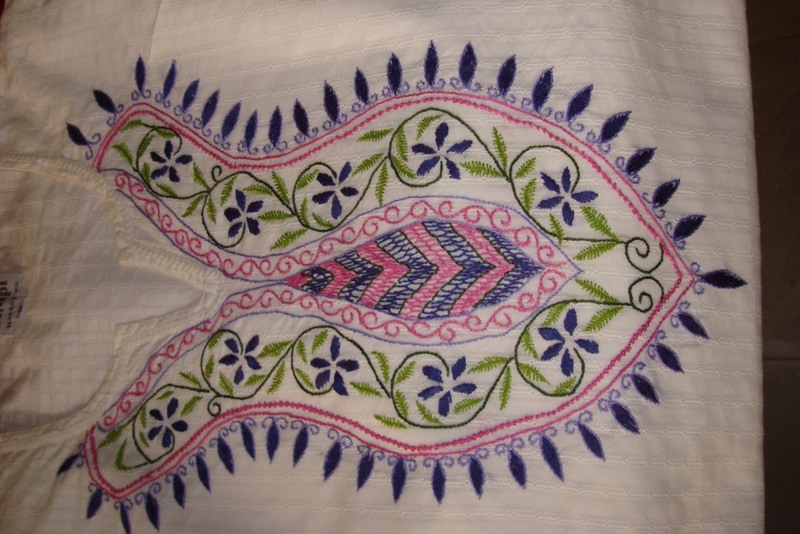 There are many stitches used in Indian ethnic chikan embroidery. Shadow work [herringbone worked on the reverse]is the most common. Eyelet stitches are also widely used. Sometimes herringbone, running stitches are also used. 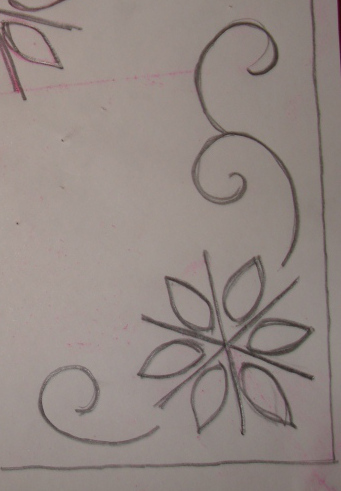 When I started doing embroidery, to learn a stitch, a design would be drawn with that stitch in mind. I’ll learn and practice that embroidery through that project. They were generally on tunics. In this project, raised herringbone was practiced on this tunic. 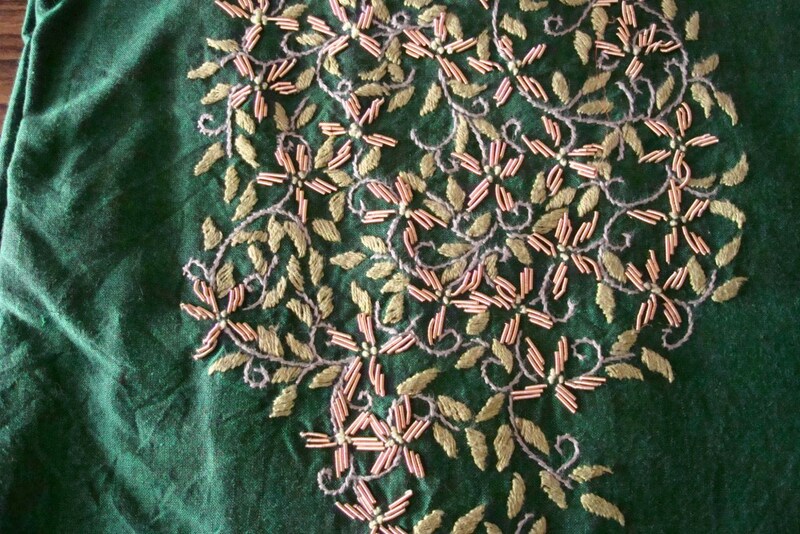 Embroidery on the corners. 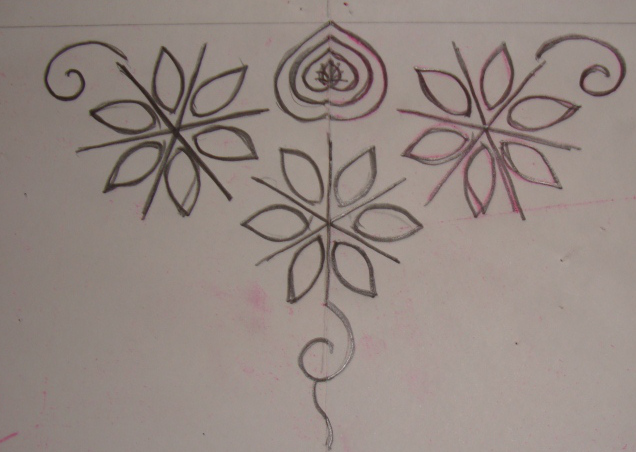 The basic flower was the same for all patterns, the difference was only on the placements, depending on how they were used –either for corner or sleeve or centre. 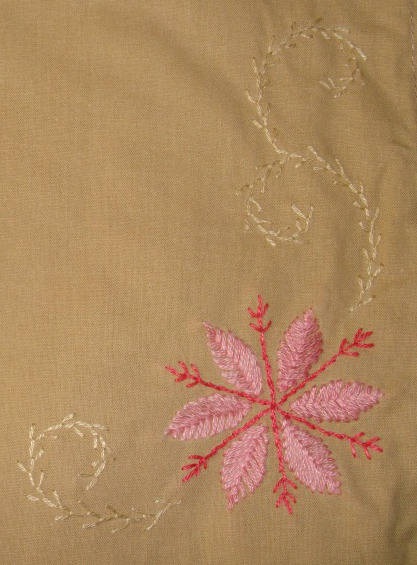 After posting the recent tutorial, I am still in the kutchwork embroidery mood. This white tunic is store bought. 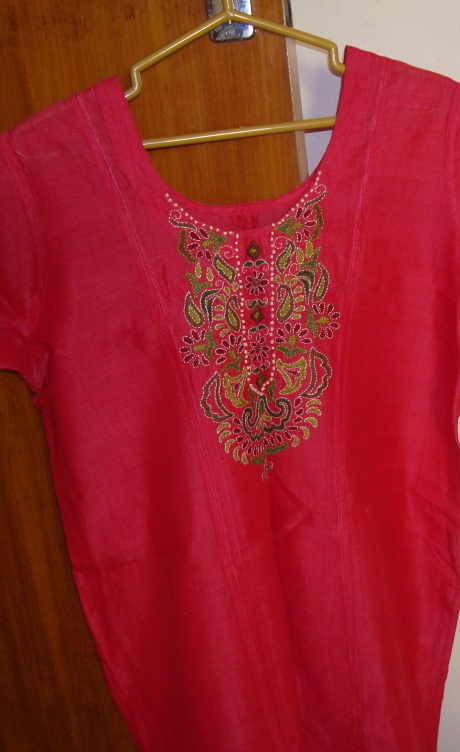 I had a striped medium violet salwar[Indian pants] for which I bought this tunic. 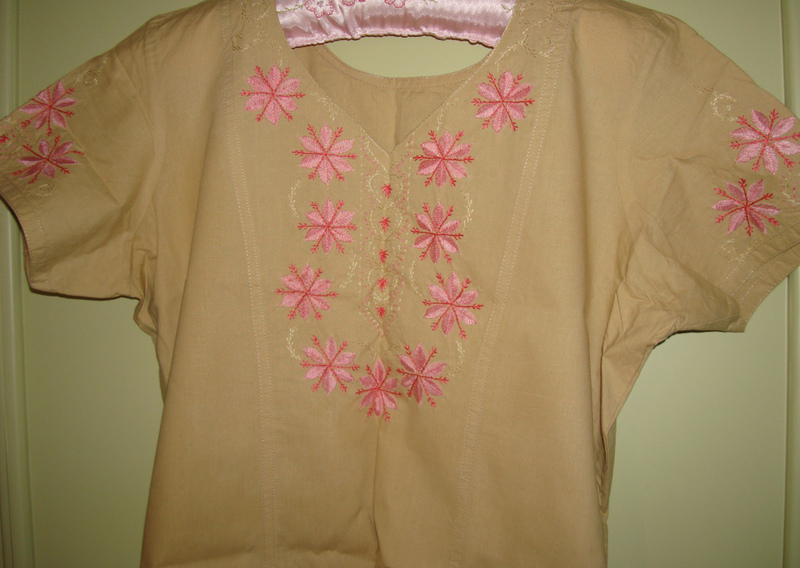 The tunic had white sequins around the neckline and sleeve lines. 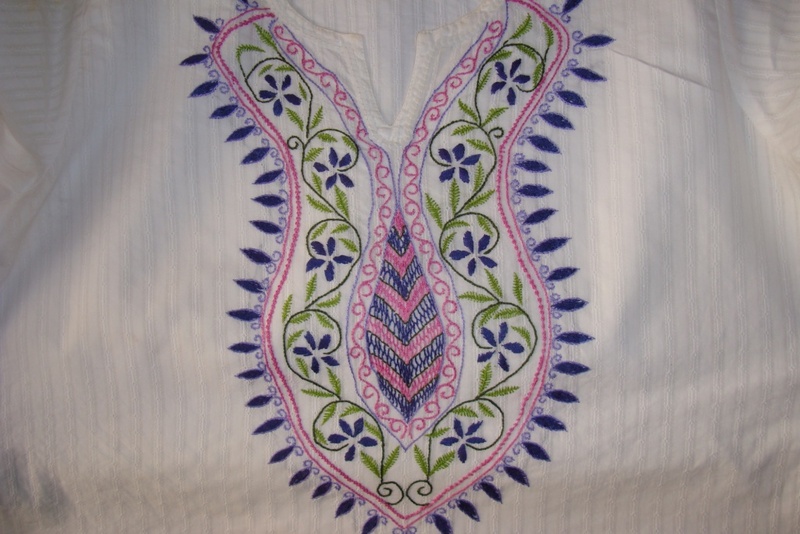 The yoke pattern was a simple floral, which had mostly herringbone stitches to be filled. 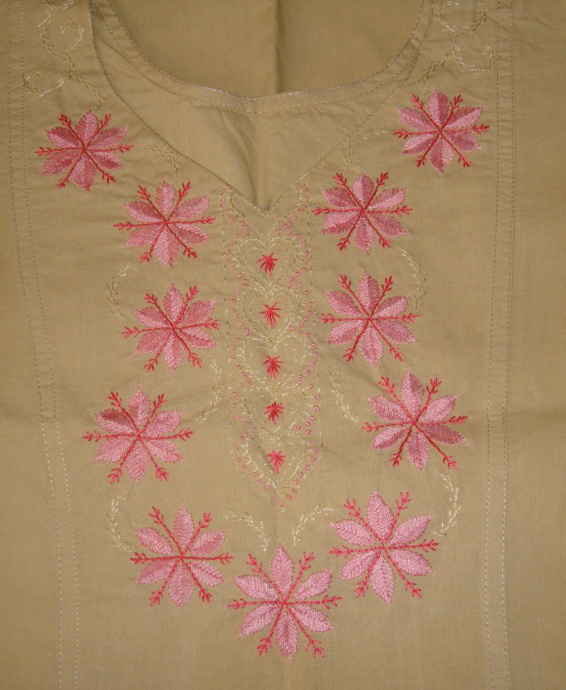 Instead of using only the violet colour, medium pink and green colours were also added for the embroidery. 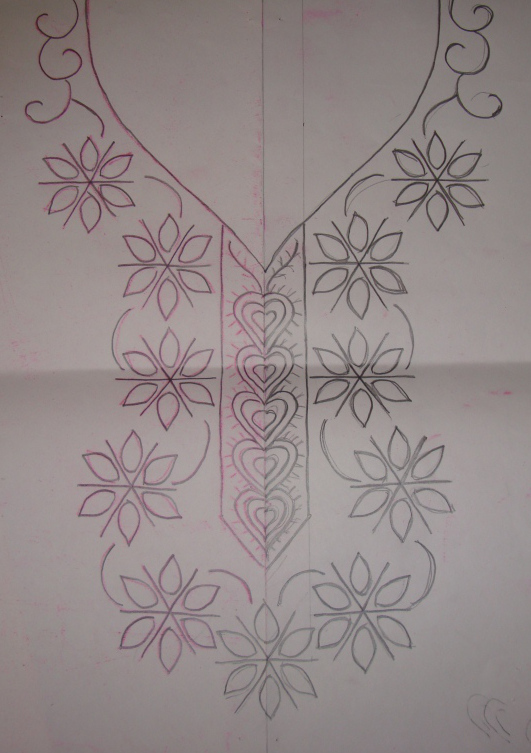 I placed the tunic over the drawn pattern, and traced it with a pencil directly on the tunic. 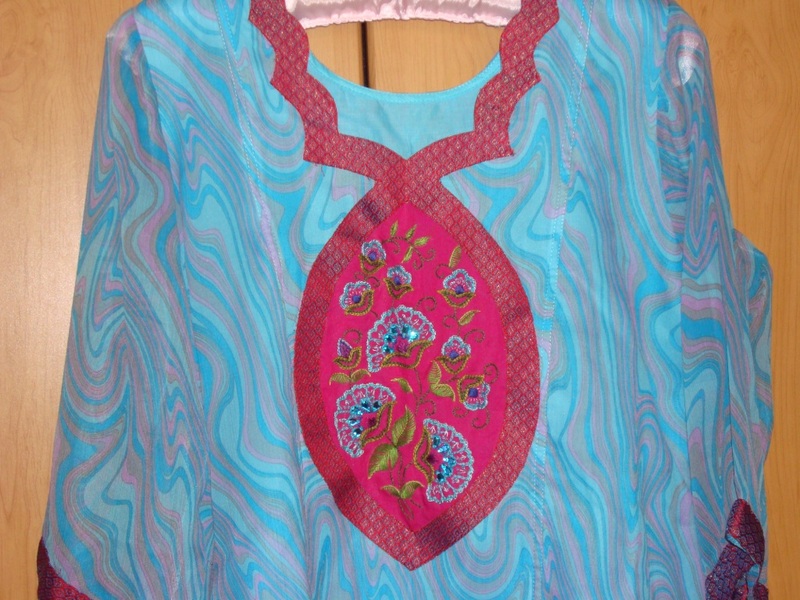 The pattern could be seen through the tunic fabric. 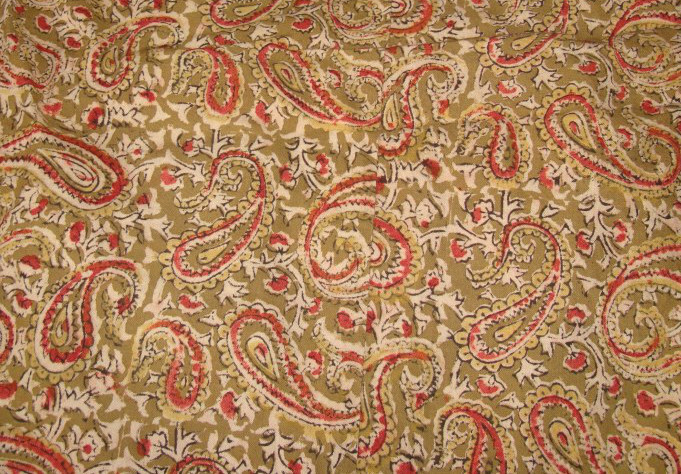 Lesson learnt-It is best to check the fabric before thinking about the design pattern. After the first wash , the back of the tunic attracted a yellow stain. I tried removing it. It is a lost cause. Surprisingly, I am still wearing the tunic, Hubby loves it. 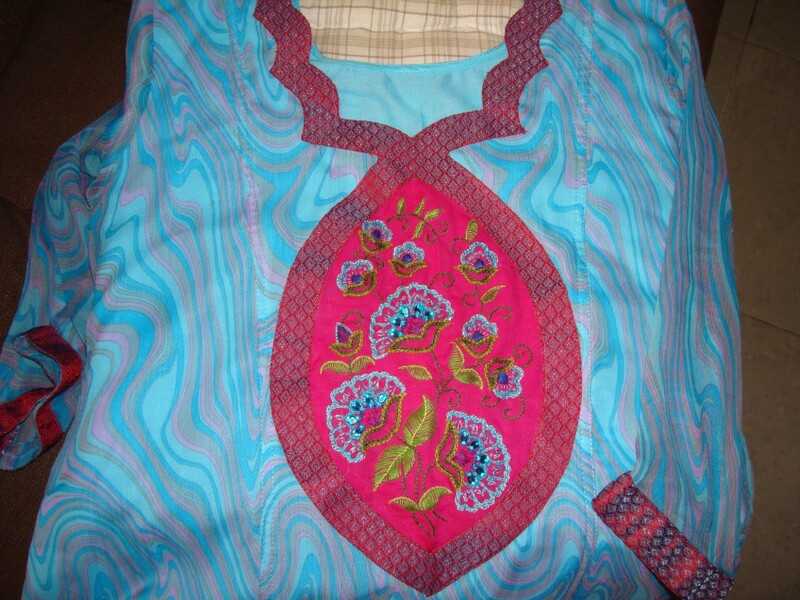 The completed blue tunic with the pink yoke, with the inspiration of the tailor ofcourse. He also said that the embroidery was’ really good’. LOL!